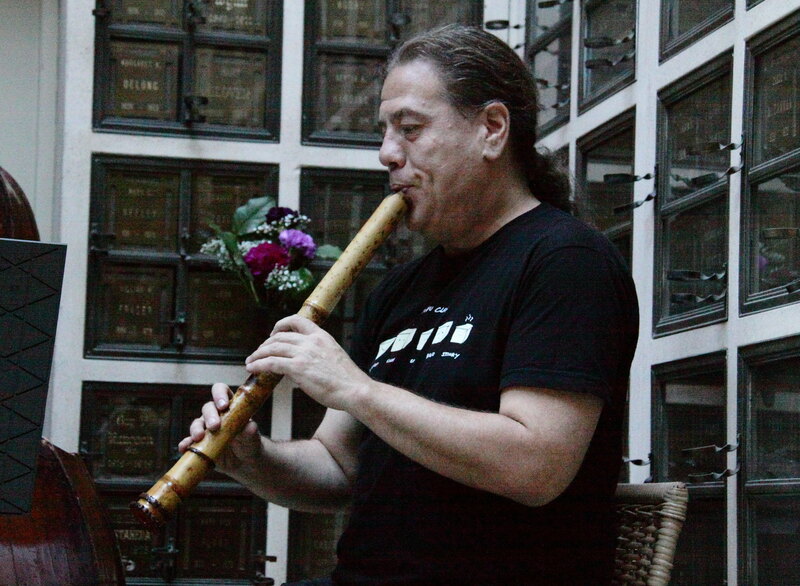 Philip Gelb performing at the June 21, 2015 Garden of Memory Concert at Oakland’s Chapel of the Chimes. For a variety of reasons I have not been able to spend any time with this blog for the last month or two but recent events tell me that I must find the time to get back online and publish. My apologies to all who are awaiting reviews and such. They will now be forthcoming. 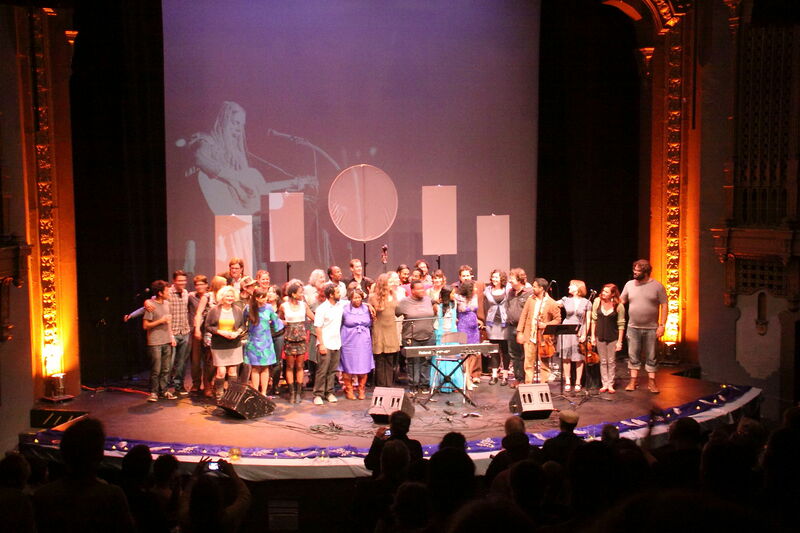 This past Saturday night June 27, 2015 is among the last of this East Bay series which has been with us for the last 10 years. 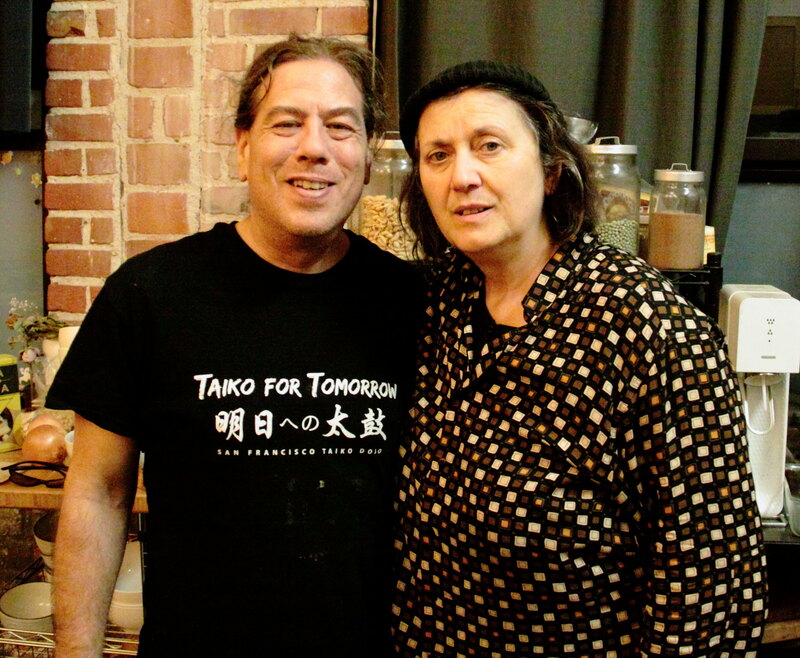 Philip Gelb, vegan chef extraordinaire, shakuhachi player and teacher has announced that he will be relocating to New York in the next few months. I personally discovered this series shortly after I moved to the bay area. In a nondescript West Oakland neighborhood in a modest loft live/work space I found a vegan dinner which also featured a performance by Bay Area composer/performer Pamela Z. One concert/dinner and I was hooked. The opportunity to meet and hear many wonderful musicians and enjoy the amazing culinary magic was just too much to resist. I have been a regular attendee at many of these concerts and they all are valued memories. Philip Gelb with Joelle Leandre at one of his dinner/concerts. 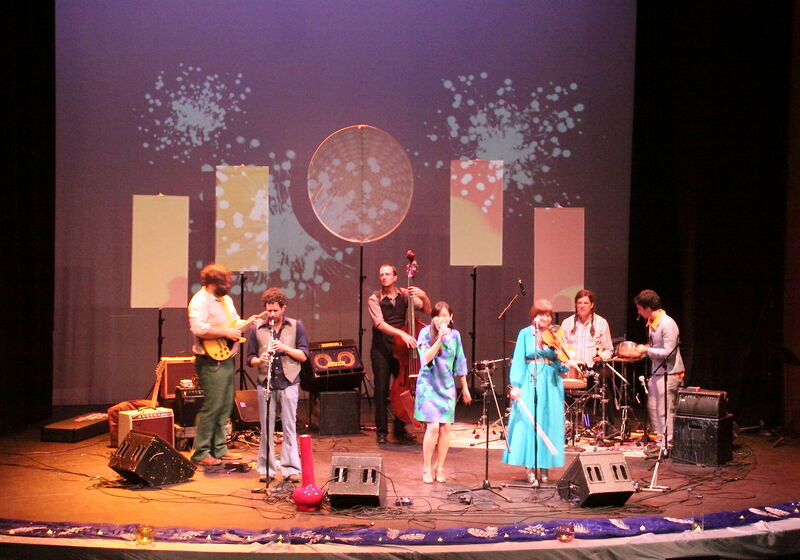 Phil, who studied music, ethnomusicology and shakuhachi has been a familiar performer in the Bay Area. 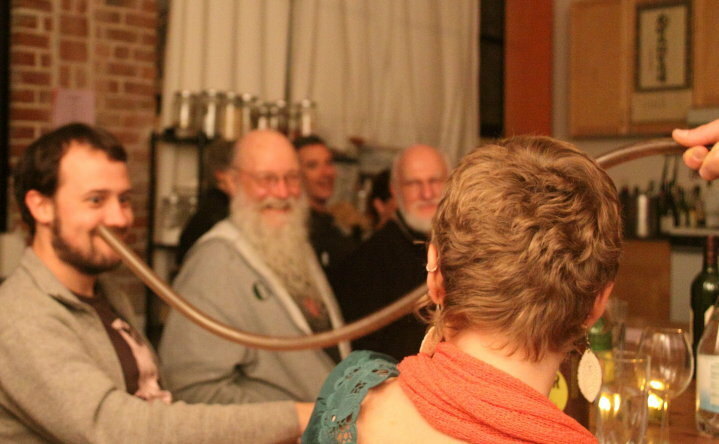 In addition to performing and teaching the Japanese bamboo flute, Phil has run a vegan catering business and began this series some ten years ago modeled on a creative music series founded in part by the late Sam Rivers. 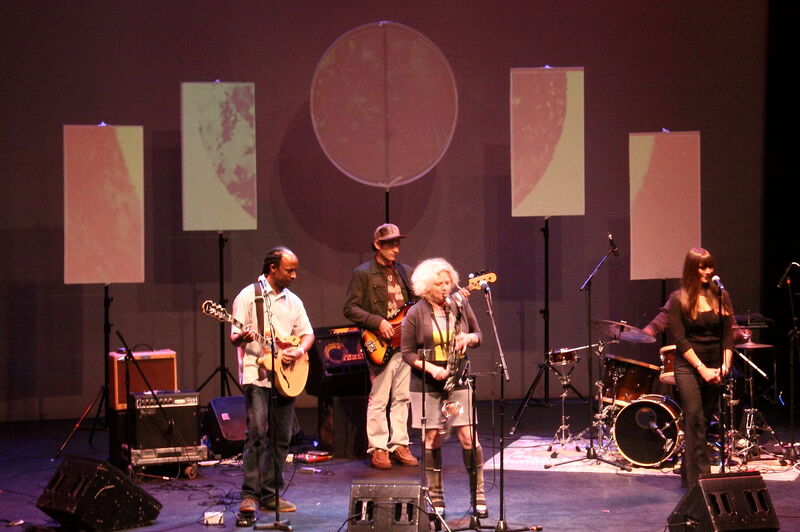 As a musician Phil has gotten to know many talented and creative musicians who performed on his series. Phil is a friendly, unpretentious man with great talents which he successfully combined here. 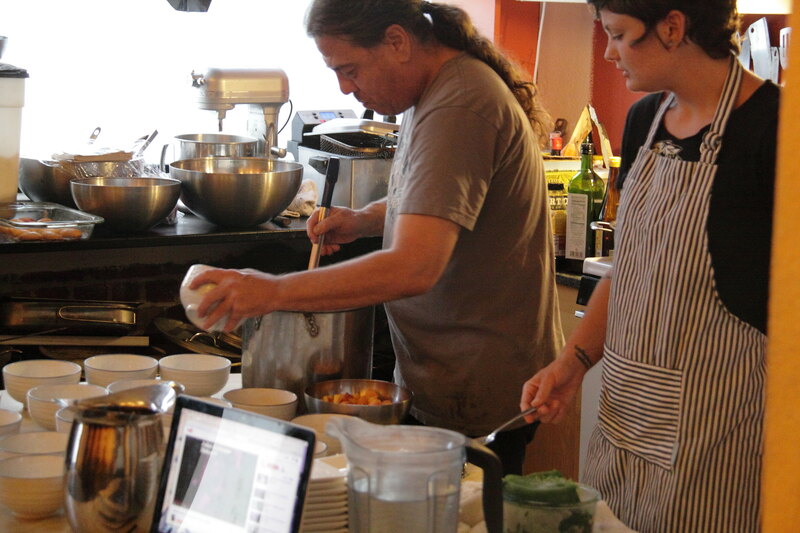 Phil and sous chef Cori preparing the evening’s feast. The 20 seats were sold out for the annual Masumoto Peach dinner. At the peak of the harvest each year Phil has put together multiple course dinners featuring locally grown organic peaches from the now four generation Masumoto family orchard near Fresno . In fact a recent film (information on the Masumoto page linked above) has been made about them called, “Changing Seasons” and one of the filmmakers was in attendance. There was a short discussion with Q and A at one point. Happy diners anticipating the next course. 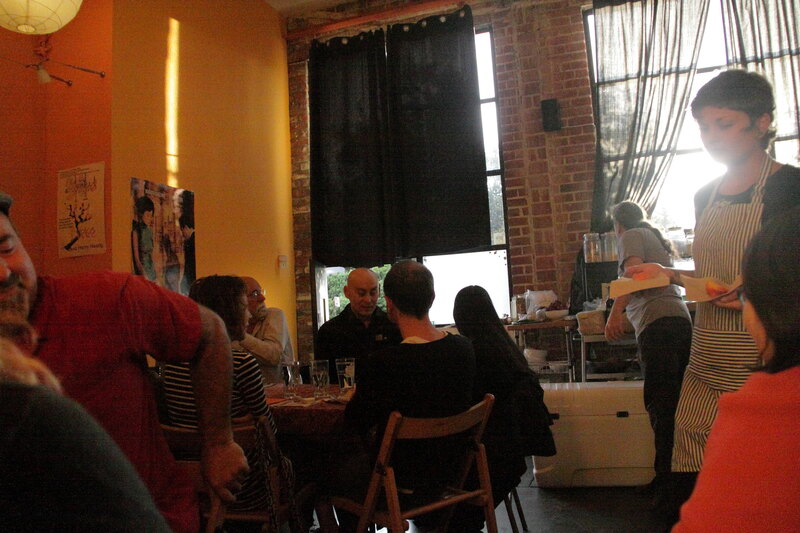 No music this night but wonderful food and friendly conversations filled the evening. 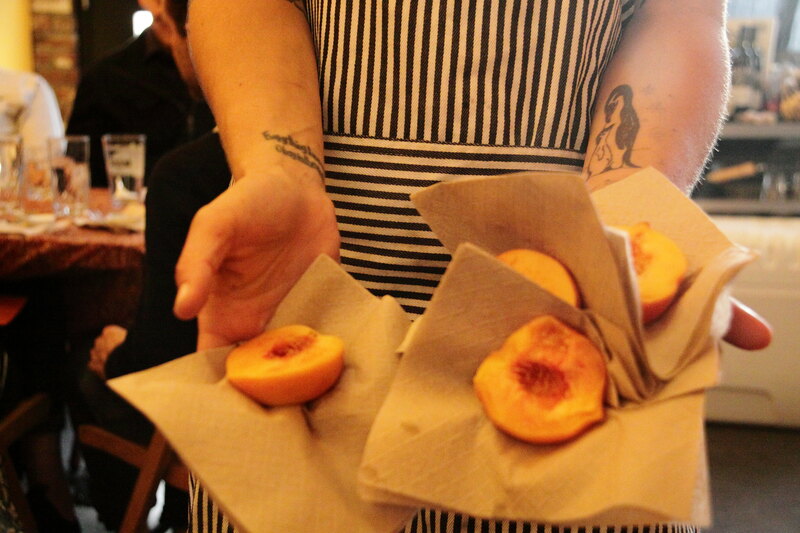 The meal began with, of course, a taste of the actual peaches. sous chef Cori serving the peach halves that began the dinner. 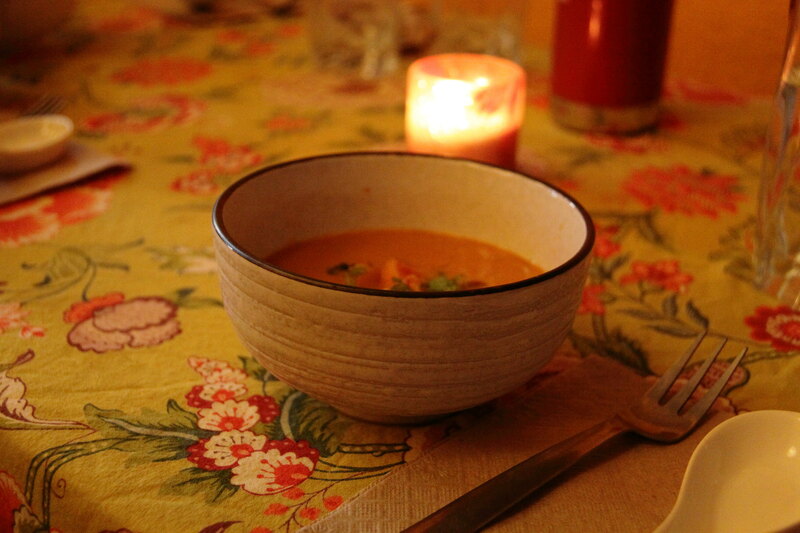 The next course, a peach tomato gazpacho. 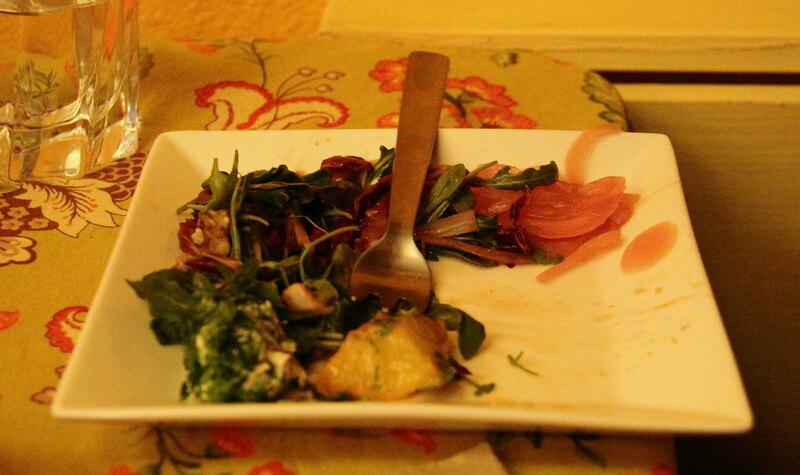 Followed by a grilled peach salad with cashew cheese balls, arugula radicchio,, pickled red onions, and a cherry balsamic dressing. 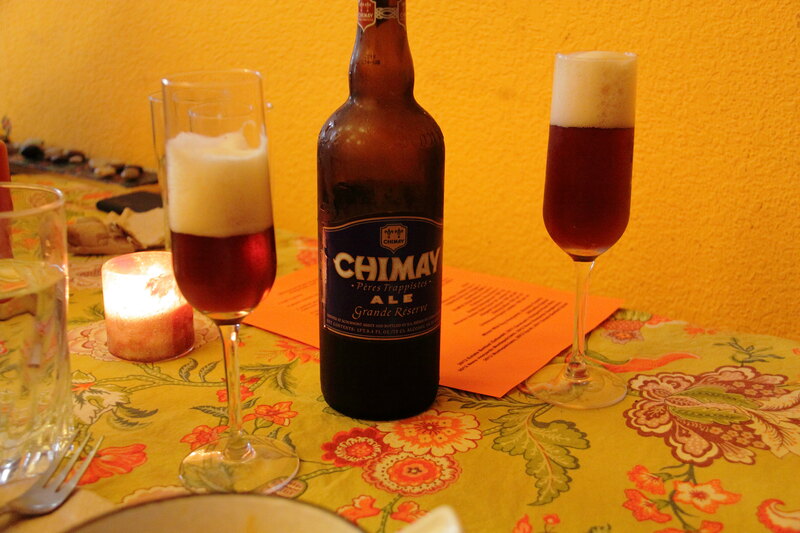 Oh, yes, a nice Chimay to quench the thirst. 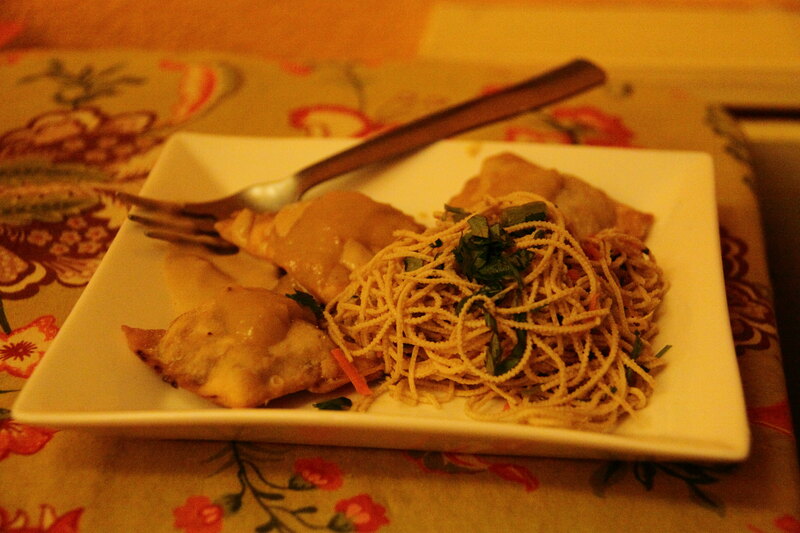 And then tempeh char siu wontons (from the local Rhizocali Tempeh), flat tofu noodles, a really great hot peach mustard and peach sweet and sour sauce. 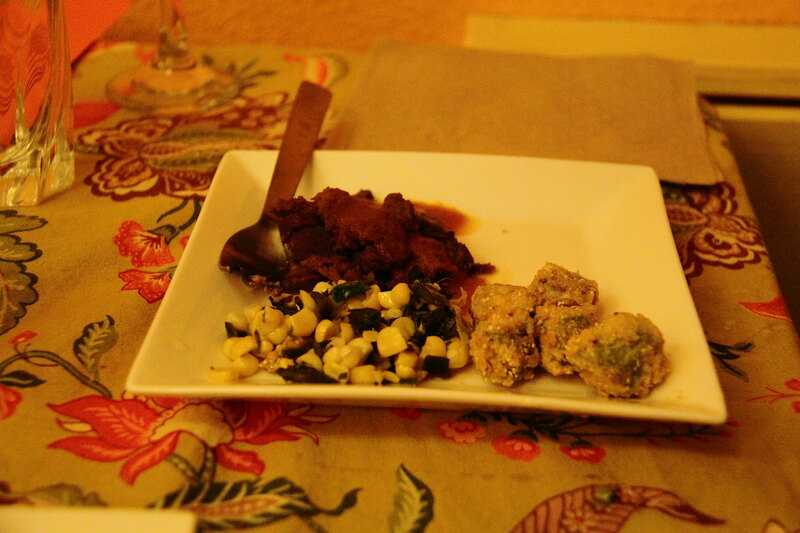 The main course: peach grilled seitan, peach barbecue sauce, roasted corn and peppers, and some crunchy fried okra. 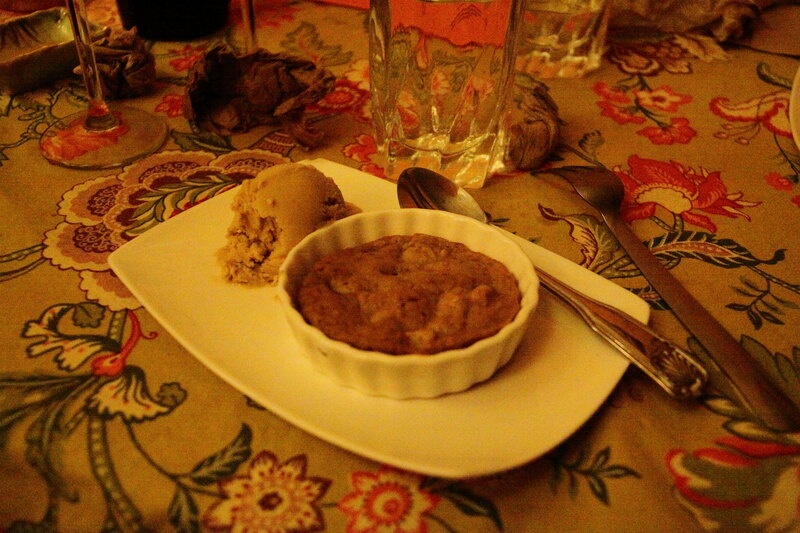 And, for dessert, peach rosewater cake with peach walnut sorbet. As is his custom Phil went around offering more of that sorbet which most folks, present writer included, availed themselves. This was a thoroughly enjoyable evening. But, as I said, this tradition is coming to an end. Not to fear, however. Phil is in the process of writing a cookbook sharing the secrets of his culinary mastery and the book will also document some of the many musicians whose talents graced many an evening here. 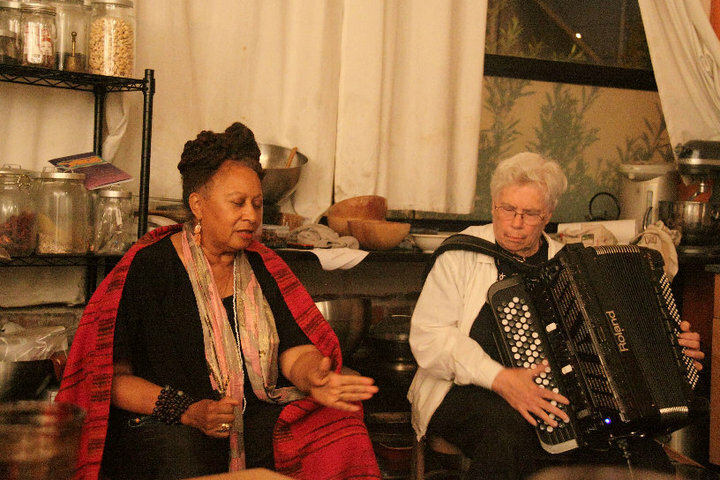 La Donna Smith and India Cooke playing an improvised duet. 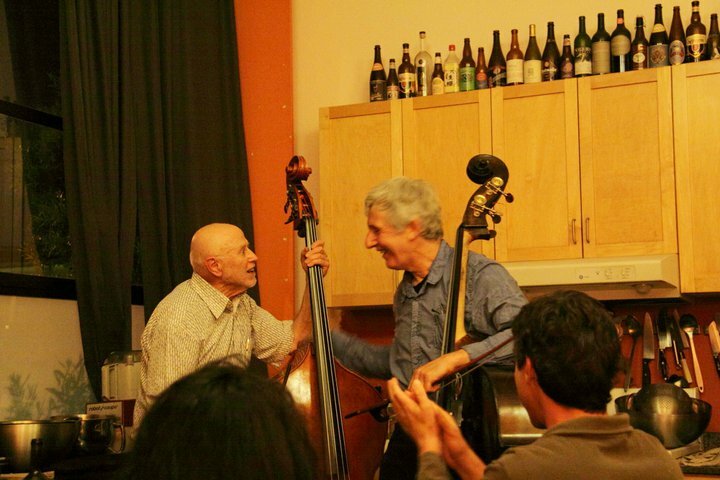 Bassists Mark Dresser and Barre Phillips play together for the first time at In the Mood for Food. The amazing Stuart Dempster at Phil’s loft a few years ago. Gyan Riley, Terry Riley and Loren Rush attending the dinner/concert which featured Stuart Dempster. 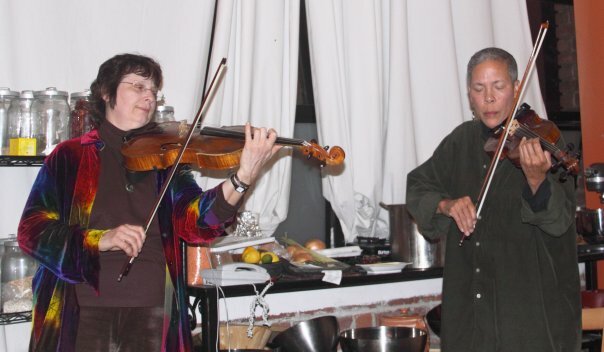 Pauline Oliveros and her partner Ione performing at a recent dinner. So this little sampling of photos provides some idea of the scope and significance of this series. Happily it is being documented in a book for which an Indiegogo campaign is presently in process. You can donate and receive any or many of a variety of perks ranging from a copy of the book for $40 and perks including an invitation to celebratory dinners planned in both New York and Oakland. My copy and my dinner invite are reserved. There are 34 days left in the campaign at the time of this writing and the project is now at 106% of its funding goal. This is a piece of Bay Area music and culinary history that will please music enthusiasts and those who appreciate creative vegan cuisine. This is one of those operas whose title evokes irony right at the start. Like Ruggero Leoncavallo‘s “Cavalleria Rusticana” (Rustic Chivalry) and Virgil Thomson‘s “Four Saints in Three Acts” the title Certitude and Joy hardly seems to evoke the right emotions in this harrowing story taken right from the headlines of a case in 2005 in which a mother kills her children and dumps their bodies in San Francisco Bay. This is contrasted with the biblical story of Abraham and Isaac in which God tells Abraham to slay his son. Of course God stopped Abraham in the bible story but that was not the case with the more recent story. Erling Wold (1958- ) is a composer of whom I had been only distantly aware. 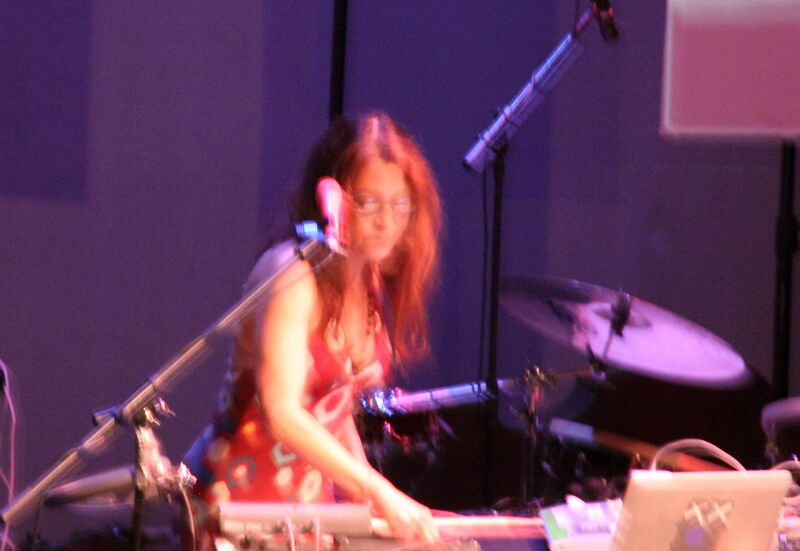 He is a California native and has studied with Andrew Imbrie, Gerard Grisey and John Chowning. That right there gives you a clue to this man’s compositional range and skills. 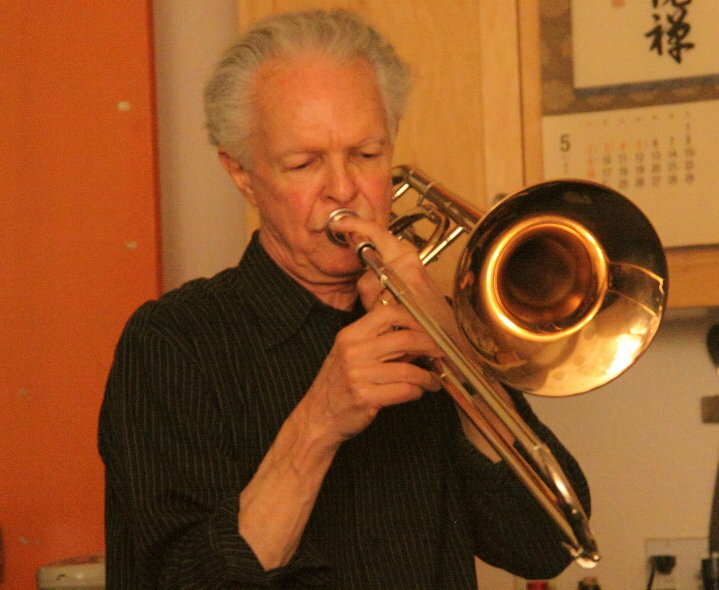 He completed a Ph.D. from the University of California Berkeley in 1987 and has worked for Yamaha creating new synthesizer programs in addition to pursuing his musical interests. The San Francisco Bay Area has such a rich and varied musical culture that it is not all that surprising to me that I hadn’t come to know this fascinating composer. And it’s taken me a while to absorb enough about Mr. Wold to feel that I could write something intelligent about this CD. The composer’s web site (click here) contains a plethora of scores and sound recordings of this prolific and interesting composer. And there are numerous offerings on You Tube and there is a blog linked on his web site in which he discusses a variety of topics not the least of which is his own music. It seems that he has created several operas including one based on William S. Burroughs’ early but long suppressed novel, Queer. His chamber operas, A Little Girl Contemplates Taking the Veil and his opera on Pontius Pilate illustrate his interest in both religious and political themes. I won’t even try to get into his orchestral, chamber and solo piano works. That is the job of a future blog which I can assure you will happen. But the main point of this blog is to look at this most recent offering of his chamber opera Certitude and Joy. As best as I can describe in words, Wold’s accompaniment figures remind me of Philip Glass or John Adams at times but he is not a simple derivative of these composers. His vocal lines, almost all sung as opposed to spoken, are more like recitatives than arias and suggest a more ensemble feel as opposed to the grand opera style of arias, duets, etc. His libretto, ripped from the headlines so to speak, is a combination of philosophical musings, imagined dialogue and commentary from texts as diverse as Aldous Huxley’s writings on psychedelics and the more pedestrian musings of newspaper columns. I think there is some affinity for Robert Ashley’s mysterious texts but again nothing derivative. The work is perhaps political as social commentary but not as social protest. What is important is that this work, thinly scored (though hardly thin in sound) for two pianos and a cast of singers, speaks directly and affectingly to the audience. He manages to tell this tale in a fairly straightforward manner with occasional digressions for philosophical commentary. But he never loses control of the narrative which flows on drawing you in to this sad story and leaves you with the questions he raises, albeit rhetorically, about the nature of religious revelation, mental illness and the current state of our society and our world. This is a tall order but Wold manages to fill it with just the right amount of drama and music that leaves the listener (and viewer if you see it live in person or on You Tube) seemingly with exactly the emotions I think the composer wrestled with in writing it. 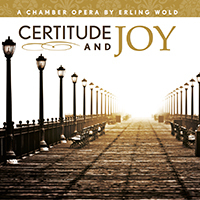 Like the aforementioned Four Saints and Cavalleria, Certitude and Joy is a listener friendly opera with messages that are disturbing and go to the core of what it means to be human. The performances by the fine duo piano team of Keisuke Nakagoshi and Eva-Maria Zimmerman (ZOFO) and singers Laura Bohn, Talya Patrick, Jo Vincent Parks, Kerry Mehling, Tranvis Santell Rowland with Bob Ernst, speaker and a cameo by the composer (I’ll leave that for listeners to find). The beautiful recording on Paul Dresher’s MinMax label is distributed by Starkland and is available on Amazon and other outlets. A worthwhile experience for all lovers of contemporary opera and drama. Despite the title, this is neither a Stephen King adaptation or that of a given miniseries. This is an actual medieval mystery play which was performed to disseminate religious ideas during that period. 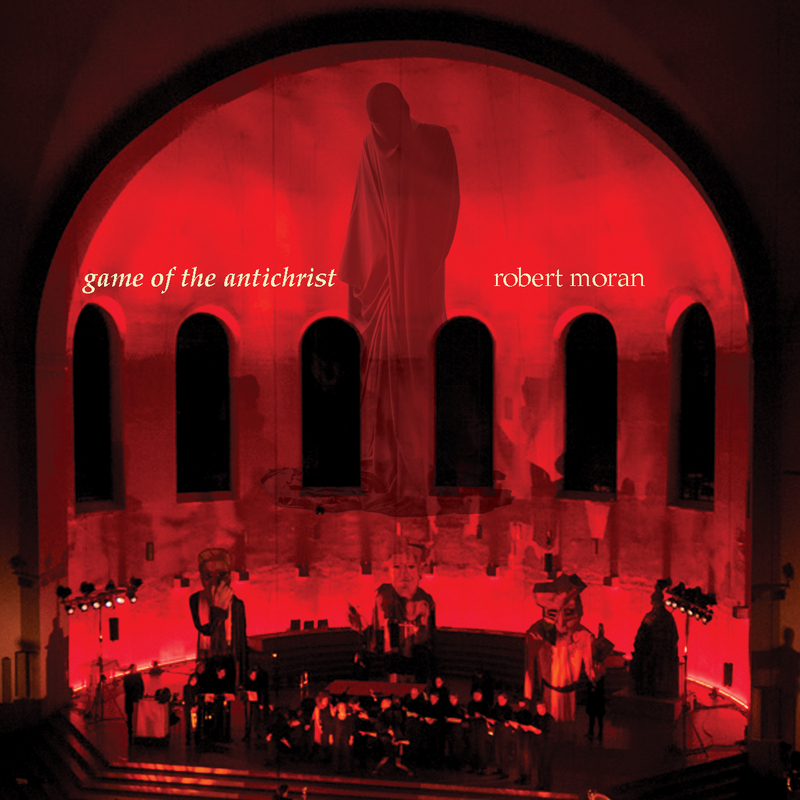 The medieval passion plays are better known but eclectic composer Robert Moran managed to find an actual drama and added to it his unique blend of experimentalism, minimalism, jazz and lyrical melodies to create this visually and musically striking (there is a Video here) setting of this forgotten little play. Moran (1937- ) studied in Vienna with Hans Erich Apostel, a student of both Berg and Schoenberg. He earned a master’s degree from Mills College having studied with Darius Milhaud and Luciano Berio. He has produced everything from electronic music, to happenings involving whole cities and has written in musical styles derived from chance operations to minimalism and is not afraid to write beautiful melodies. His collaboration with Philip Glass in The Juniper Tree (1985) is a fine example of his facility with vocal writing and music drama. This drama is performed in a cathedral space and Moran takes advantage of the resonant space by the inclusion of Alphorns, harp and organ whose tones are transformed in part by that space. 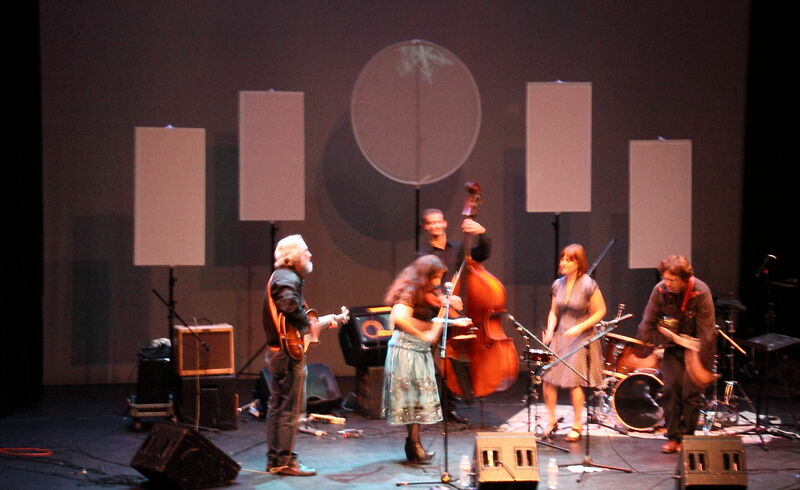 Musical styles vary suited to the unfolding drama and work well with the staging of the piece. Moran, who professes a love of opera since about the age of 9 or 10 has a great sense of the dramatic and for beautiful vocal writing. He says he listens to operas all the time. His 2011 Trinity Requiem was written for similar forces and performed in a similarly resonant space also to great effect. And his sense of eclecticism allows him to select from a wide variety of musical styles and effects. The end result is, for this reviewer, a very successful integration of the composer’s various skills and influences. It would be hard to imagine a better setting of this piece. He starts with an anonymous text from Quirinus Monastery Cloister Tegernsee in Bavaria ca. 1150 and, with Alexander Hermann, creates a realization for performance. The piece is scored for children’s chorus, vocal ensemble, soprano, mezzo-soprano, counter-tenor, oboe, english horn, Alp horn, Bar piano and organ. 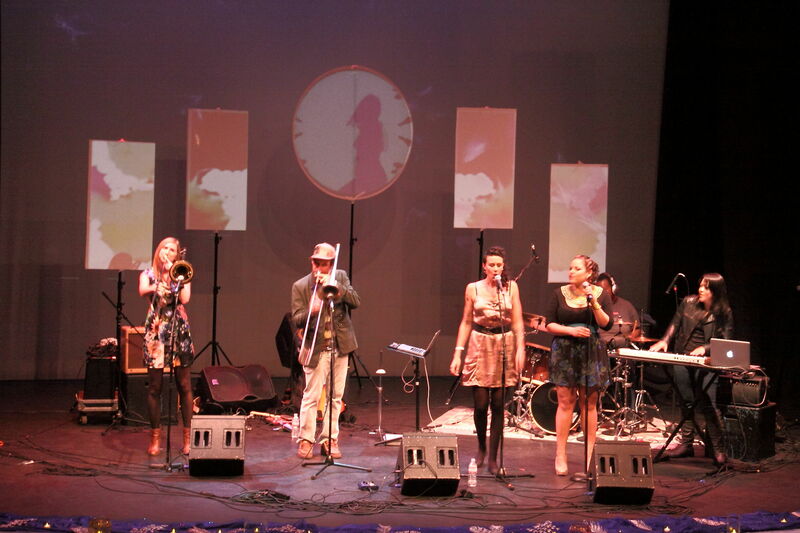 In addition there are two other defined ensembles consisting of harp (representing the Heathen and his Babylonian followers), guitar, recorders and synthesizer (representing the Synagogue and Jerusalem), trumpets, horn, trombone, bass trombone, tuba and percussion (representing the Church and its Devotees). There are roles for dancers and, in the performance depicted on the CD cover, choreography by Jarkko Lehmus and Bettina Hermann design by George Veit and menacing puppets created by Fabian Vogel. Unfortunately there are no current plans to release a DVD of this work but settling for the music alone is hardly a terrible sacrifice. 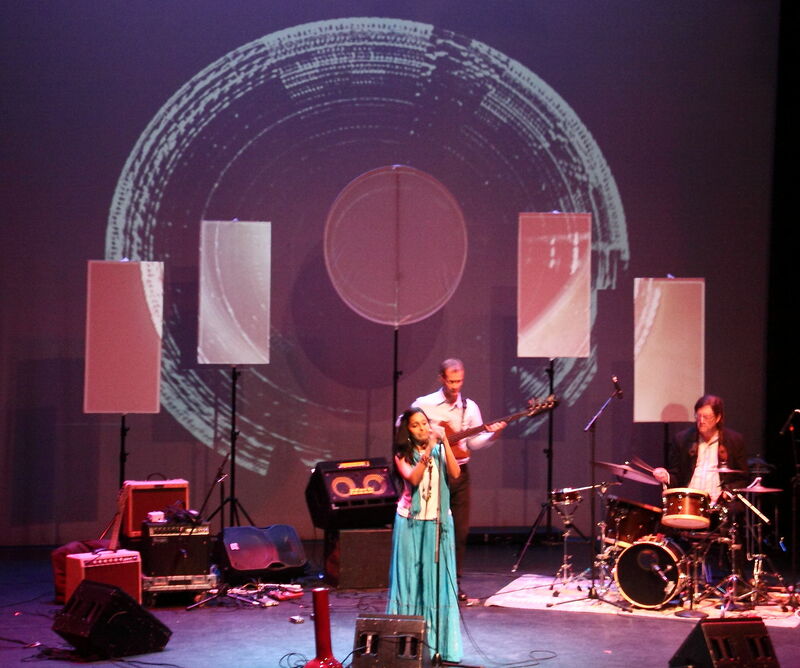 Moran brings his eclectic musical range, knowledge of opera and music theater combined with careful selection of dramatic text to create a piece that can work as aural theater as well. The disc concludes with another piece, Within a Day (2014), of aural theater which, in this case, has no specified stage actions. 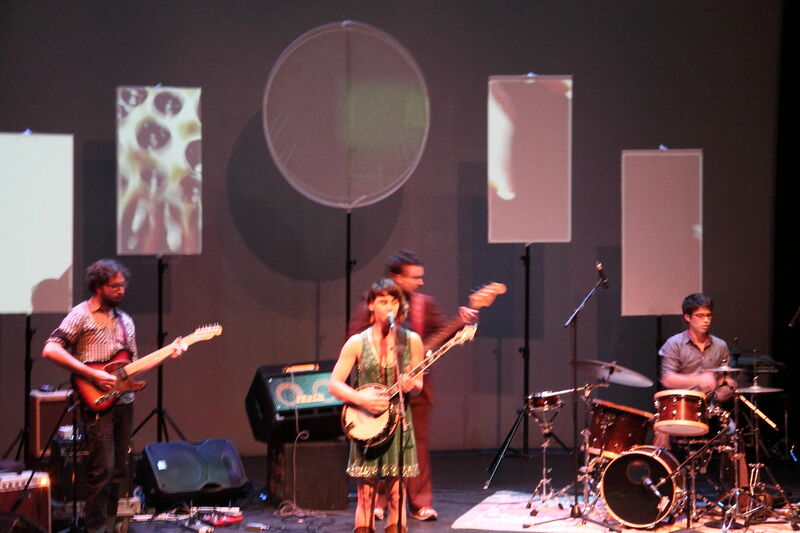 It is a collaboration with the Thingamajigs Performance Group, Edward Shocker’s improvisational ensemble. 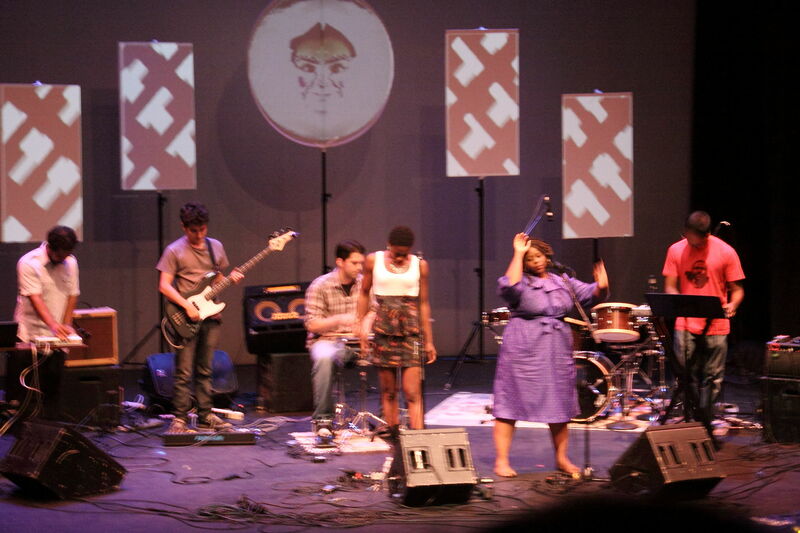 It is an example of Moran’s ability to write less determined music as well as his ability to collaborate with other creative artists. 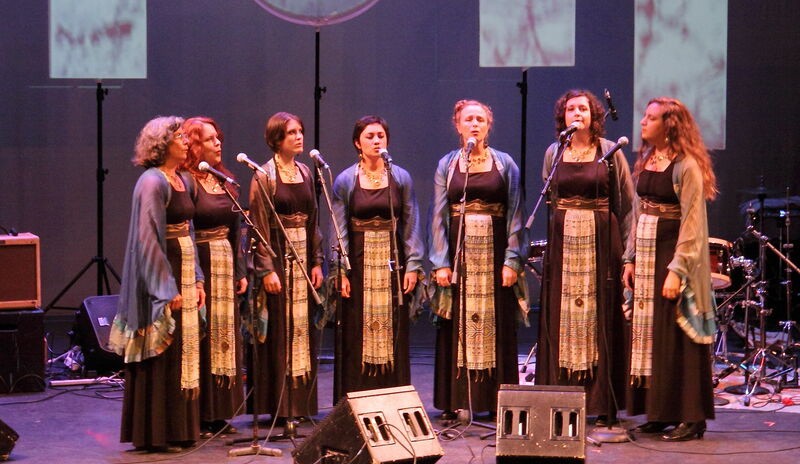 The piece premiered at San Francisco’s Center for New Music in January, 2014 and subsequently recorded in Lisser Hall at Mills College in May, 2014. 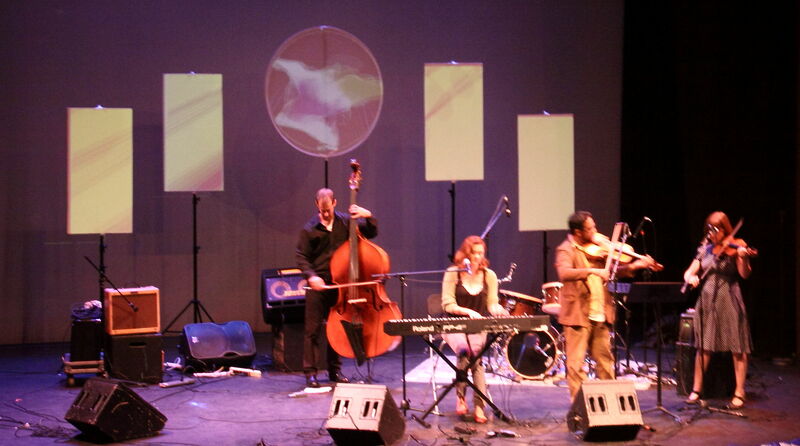 It is a collective improvisation based on what appears to be an indeterminate score by the composer. This is a clearly different music with more abstract aims and it contrasts strangely with the music drama but this is a good example of Moran’s facility with the art of composition as well as collaboration (Can you get more collaborative as a composer than an indeterminate score?). This more ambient sort of music is a little sonic theater for the mind based loosely on Moran’s interest in Tibetan texts invoking the gods and goddesses through their chants. This disc made one of my best of 2014 and I highly recommend it for listeners interested in music drama and sound theater.